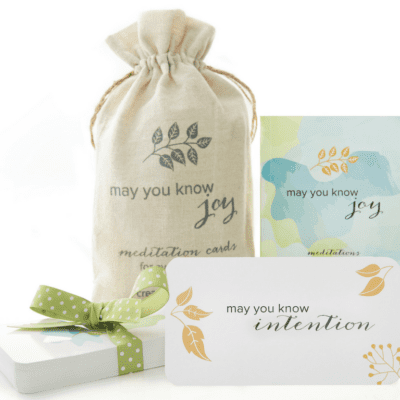 May You Know Joy cards as well as the little sister Seeds of Intention Cards, are both designed to inspire daily reflection, intention setting and conscious living. The May You Know Joy cards come ribbon-tied, a companion booklet with a page devoted to each card, enclosed in a beautiful (yet, not photogenic) linen bag. Seeds of Intention cards are snack-size – both in terms of physical size and what’s asked of you. Price is in US dollars. What a perfect combination to bring a little bit of joy into my everyday life! I bring these cards out before starting a meeting, or having coffee with a friend, and even with my family (although they aren’t totally into this amazing spirituality stuff!) and it’s pretty incredible what it opens up and can bring to the table and the conversations… THANK YOU for offering such a special gift.